Pros: Superb double act with strong and powerful voices. Cons: Dated material, no stand out songs and a predictable plot. A strong acting and vocal duo do their very best to lift this camp and kitsch musical, to no avail. As part of the wonderful Actors Centre, the Tristan Bates Theatre presents a year long mix of work dedicated to supporting and showcasing new writing and contemporary theatre. Tucked away in London’s Seven Dials in the heart of Covent Garden, this theatre is a hidden gem. I had the pleasure of doing some workshops at The Actors Centre many moons ago, so have always loved and supported it as much as possible. Which is why having to write this review breaks my heart as its current production, Pete ‘n’ Keely, is flawed and disappointing. 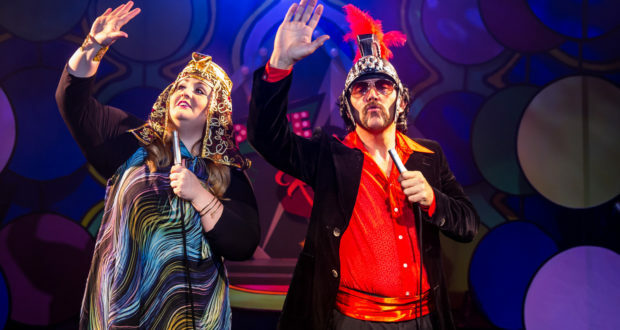 Pete ‘n’ Keely is a musical about an estranged all-singing all-dancing husband and wife double act desperately trying to resurrect their flailing careers with a special live TV reunion. 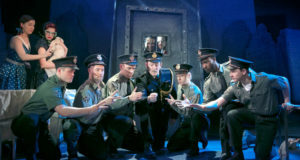 The show first appeared off Broadway in 2000 and, after mixed reviews across the board, it only lasted for 100 performances. It’s not hard to see why. However, as is the nature of shows that disappear, it garnered a strong core fan base which then resulted in cult status across the noughties and into the tens. I fear this show is like Marmite. You’ll either love it or you’ll hate it. Sadly I’m not a fan of yeast extract. 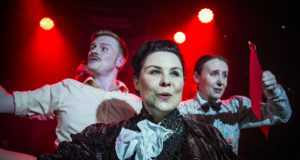 Unsurprisingly the show has never been performed in Europe before, so this fun and fast paced adaptation at Tristan Bates was its European premiere. 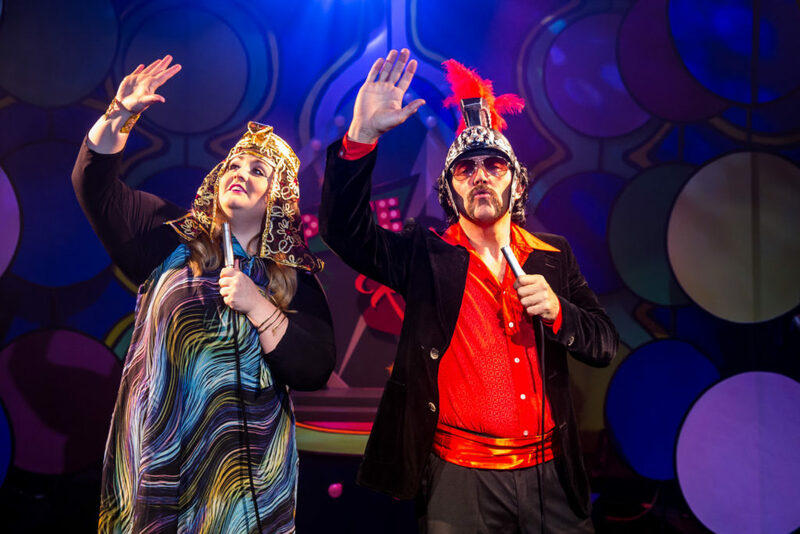 With its bright and kitsch set, beautifully designed by Emily Bestow, we are all catapulted back to the glory days of 1968! America’s sweethearts Pete Bartel and Keely Stevens are performing live on national television! The only catch? They haven’t spoken to each other in five years. Through a non-stop parade of songs from the 50s and 60s – highlighted by several flashbacks – Pete and Keely relive the rollercoaster ride that got them where they are today… divorced! On paper it works, but sadly I found the songs weak and repetitive, and the book and plot far too predictable. This show is a pastiche of that all American “Coming to you LIVE” cheese and you need to embrace it as it’s relentless. If truth be told, after a stressful day at work I just wasn’t in the right head space for so much in your face saccharine. If you can get passed it, at its core Pete ‘n’ Keely has some wonderful heartfelt moments of unfinished business, loss, old school Hollywood and regret. I wonder if the pastiche could be modernised in some way? I appreciate the wonderful Matt Gould’s direction embraces the shows themes and nuances, but I was craving a potential selfie or tweet reference to mix it up a bit. Pete and Keely on Ant & Dec’s Saturday Night Take Away could make for interesting viewing. The cast are superb. Pete is played brilliantly by David Bardsley whose deep husky voice carries beautifully throughout the two acts. His wig also needs a special mention as it’s a thing of beauty. Keely is played to perfection by the stunning, velvet-voiced Katie Kerr. Watching such wonderful facial expressions you can’t help but be drawn to the character and will shortly find yourself rooting for her! Another shout out needs to go to the ravishing audience member Jocelyn, who was suddenly pulled onto stage as a “LIVE” competition winner and took to the spotlight like a duck to water. The duo, along with the help of the band, hold this show together, however I feel they are let down by the score and book. Like the emcee says “No matter what the tabloids say, they’re getting along just fine ladies and gentleman…”, but I will leave that up to you to decide. A Scottish South African Londoner. From being a TV presenter to an extra in Sinbad, and from being Big Ears in The Adventures Of Noddy to the evil Herr Zeler in The Sound Of Music, Neil had a fun acting career post graduating from theatre school. He stupidly made the promise to himself to stop acting if he didn't have his Oscar by 30 so as the big 3-0, and lack of a gold statuette, loomed he retired and is now a publicist. The arts is in his life blood so Neil will often be found in a theatre getting goosebumps from a play, balling his eyes out at a musical or interacting with a random piece of modern art in a gallery. From entering the world,quite literally, during a performance of The Towering Inferno, he's always had a passion for cinema and recently launched a film blog as the dream one day would be to be a full time film and theatre critic.